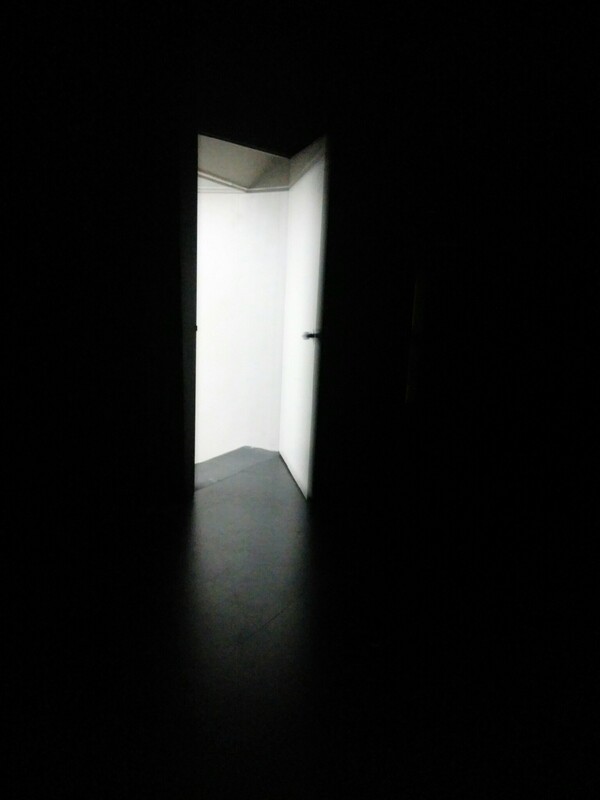 The Door is Open. Walk through it. No one is going to do it for you. You have to walk through it yourself. What’s holding you back? Doubt? Success isn’t guaranteed. You might be staring at that open door for the rest of your life, but there is one thing that’s for certain. You’ll never walk through it if you don’t move yourself in that direction. What’s holding you back? Failure? There will be many missteps along the way. They may be painful. They may be discouraging. They may make you think that the door was never meant for you in the first place; that you’ll never be good enough. But before you will ever be good enough, you have to be strong enough. Strong enough to shake off the critical glances from others, gleaning from the results that will make your incremental movement slightly better next time. Strong enough that there are others who may enter the through the door before you. Strong enough to be okay with that. If the door is really important to you, if the passion is real, if you have built the proper foundation for the door to be feasible, if you’re going to keep going whether the door ever becomes a reality, then this is for you. Keep your eyes on the bright light, the goal, the magnet pulling you in. Give in to it. Fixate upon it. It’s yours and only yours. Stand up and fulfill your call. When good ideas impregnate the mind, why fight them? Over the past three weeks, I’ve had a novel idea, actually related to novel-writing, and I haven’t been able to shake it. Even in the midst of revising novel #5, which was supposed to be my priority, this new idea has consumed me every free moment that I’ve had. And the plot – it’s embarrassingly exposed – like I downloaded the novel’s Cliff Notes and have been cheating on my writing. It’s seemed so easy, so smooth – the dialogue, the characters, the setting – all laid bare in front of me. This is the type of inspirational groove that I hope never leaves me. So why am I losing? Because I’ve lost control of all other parts of my life because of this novel. So why am I winning? Because I love writing this novel and have had so much fun putting it together. Why has it been so easy so far? Perhaps it’s an unimportant question that I shouldn’t try to answer. Just count it as a blessing and enjoy it while it lasts. But I have to say that I might know what’s going on. In this novel, I’m starting from a premise that is completely unlike me. It dabbles in the supernatural and fantasy genres which, if you’ve read any of my writings, you know if not what excites me. I like real, down-to-earth human stories. However, this unique premise has allowed me to tell a human story in a very different way. It has led to new discoveries and new ideas that I wouldn’t have thought of anyways. And while the end result will be different from much of my other works, the reader will undeniably see the same creative Sasse hand at the helm. So if your inspiration is stuck firmly in a hole filled with quick-drying cement, shake things up a little. You might find yourself losing a lot of time on a winning idea. I have three weeks of Christmas break on a tropical island. You might think it’s a paradise for writers. Well, not to rub it in, but it is. My breaks away from teaching have fueled my writing habits for years, and this one is no exception. As I type, I’m sitting shirtless on a lounge chair, by the pool of a resort in the Straits of Malacca. My chair is overlooking the sea and the various water sports being enjoyed by the many vacationers. A delightful breeze has kept me so cool that I haven’t even dipped into the water yet, though that surely will come soon. And I’ve been typing away on my laptop, knocking out another 1500 words in my latest novel. Let me clarify latest, however, because my novels always overlap each other. I finished my fifth novel a couple weeks ago, and now over the next two months will try to revise and edit it into publication shape. But that’s not what I’m working on now. Over break, I like to take advantage of the long empty spaces in my life and try to get some serious writing down. I don’t consider revision serious writing. It’s just seriously painful, and I like to do it in small doses. But for my creative moments, I like large chunks of time. And so I’ve started novel #6 before novel #5 is revised. I must say, I’m thrilled with how novel 6 is quickly forming in my mind. It’s one of the more interesting ideas that I’ve ever had, and it’s certainly different from anything I’ve ever written. I seem to do that a lot. If I had to categorize my novels, I would say that #1 (Beauty Rising), #3 (The Reach of the Banyan Tree), and #5 (Which Half David) have a lot of similarities. Of course, not in story or characters, but in backdrop and style. However, novel #2 is very different and unique from any of them, and novel #4, my latest, also is unique. Novel two is a combination of 5 stories told in a unique manner. Novel 4 is, as someone recently told me, a “historical tall-tale” – kind of an oxymoron – quite different from anything else I’ve written. The one I just started, #6 falls into that unique and different category. It has strange supernatural elements that none of my other novels have ever had. I am very excited about it, though, as I find it gripping and fascinating even though I’m the writer. I’m currently 12,000+ words into it. I can’t wait to see where it will be heading. So that’s my break. Sun, sand, water, and writing. I think it’s time to hit the pool. 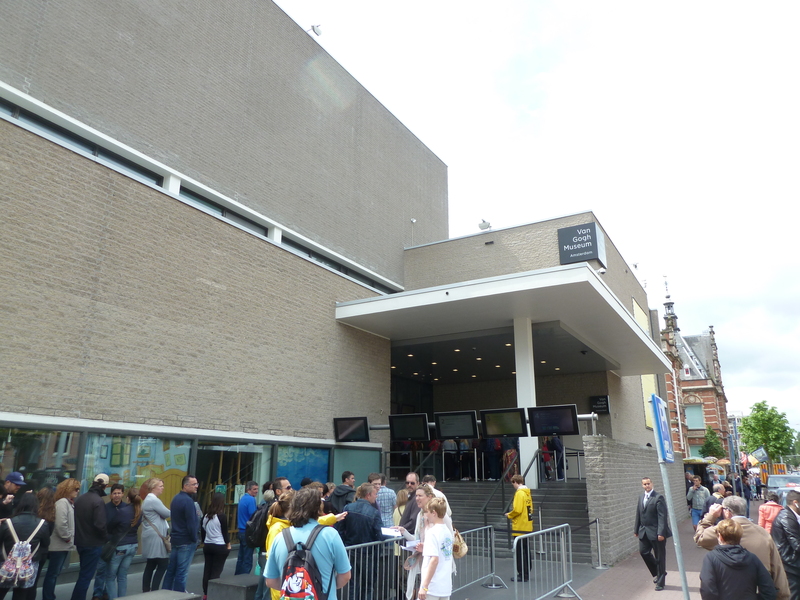 I had the privilege last week of going to the Van Gogh Museum in Amsterdam. I took the self-regulated audio tour, and I must say, I was impressed. Not only with the museum but with narrative they told about Van Gogh. The museum is a beautiful four-story building, tastefully decorated with engaging displays of over 200 of Van Gogh’s paintings and sketches – the largest Van Gogh collection in the world. Okay, so the outside of the museum is more utilitarian than inspirational. It kind of looks like a high school, doesn’t it. Okay. Even that is a lie because we weren’t allowed to take photographs of the exhibits. This was a poster of one of his self-portraits in a nearby park. But still, you can’t help but admire Van Gogh’s brush strokes. How much of Van Gogh was pure genius and how much was hard work? As if often the case, hard work seems to win out, eventually pushing genius to the forefront after many years. Typically, genius isn’t in the mindset of the individual at all. Genius is a label conferred on someone after the fact, when people of “know” have had an opportunity to assess and critique someone’s work. This was Van Gogh. The hard-working painter who wanted to discover new ways and modern ways to express his views of the world. It didn’t just come. It had to be nurtured and worked at over a ten year period. What stuck out to me about Van Gogh is the descriptions of his work ethic. He observed and experimented. He did self-portrait after self-portrait in order to master his new skills. He worked incredibly hard to improve, to learn, and to realize that he had more yet to learn. Van Gogh was not the instant genius. He had God-given talent, yes, but it wasn’t enough. He had a hunger, an insatiable drive to improve and create. 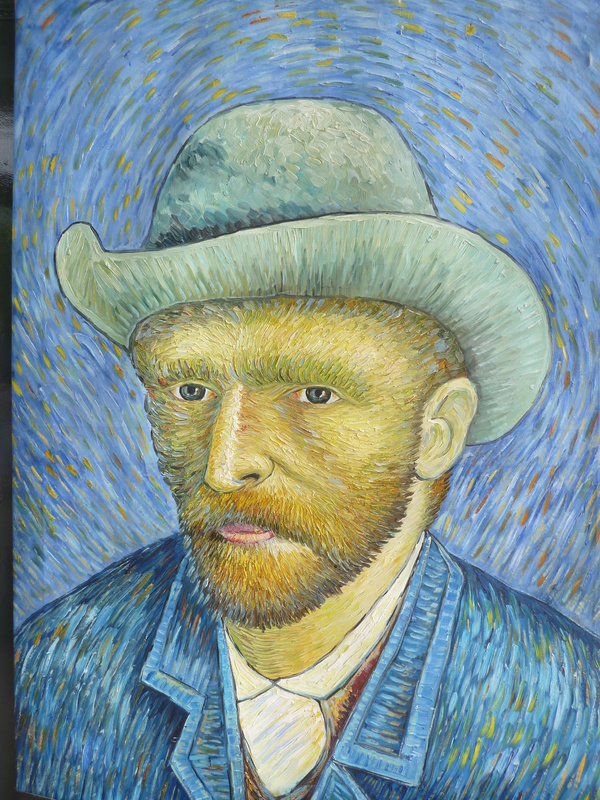 I wonder what kind of lesson indie authors can glean from Van Gogh. Of course, it’s obvious. One cannot sit still. One cannot rest on one’s laurels simply because indie author laurels are quite tiny indeed. Van Gogh’s drive has renewed in me the passion to improve. I want to further my vocabulary, continue to work on my descriptions, and delve deeper into more creative worlds of fiction. I’m happy with what I’ve done in the past, but I’m not satisfied with it. Here’s to renewed vigor, thanks to Van Gogh. There were three specific items which led me to be an indie author. 1) A desire to be creative. 2) My introduction to drama. 3) My ten years living in Vietnam. I have always wanted to create. I remember writing songs and plays as as teenager, just trying to find an outlet for what was going on in my mind. In college it was poetry that caught my fancy, and I wrote lots of various genres of poetry as an outlet. After that, I wrote various plays and small production in my church. I’ve always wanted to create and write, but I went for twenty years not doing much of it. Drama. Drama changed everything for me. Once I had an opportunity to write drama with some of my students, it started this drama-like epoch which still hasn’t finished. I love writing dialogue and creating scenarios where extraordinary things happen. I’ve been writing drama for eight years now, and there’s no end in sight. Lastly, my ten years in Vietnam expanded my horizons beyond that of any normal Western PA native. I learned a language, I learned a new culture, and I was constantly overwhelmed by the sights, sounds, and smells of the amazing country of Vietnam. My time in Vietnam led me to my passion for history and an understanding of what really happened here, both before and after and Americans landed. All of these led me to become an indie author in December of 2012. Since then, I’ve released three novels (the fourth just weeks away) and all of them somewhat based on my experiences in Vietnam. How couldn’t that affect me? It was such an important and profound experience for me that as soon as I left Vietnam, I was ready to process it through my writing, which I did with “Beauty Rising,” “The Recluse Storyteller,” and “The Reach of the Banyan Tree”: my first three novels. I’ve moved beyond Vietnam. My new novel doesn’t even mention Vietnam. SHOCKING! Vietnam was my original inspiration, but now I am burdened with an endless supply of internal inspiration, which I hope I have time to release! With my fourth novel, I realize I have moved beyond Vietnam. It’s a crutch I no longer need. That doesn’t mean I won’t revisit Vietnam anymore in my writing. I already have a political thriller based on Vietnam that I want to write. But I no longer rely on Vietnam. I am beyond Vietnam, and that’s a wonderful feeling. Vietnam, thanks for the inspiration. But I can take it from here. Before bed last night, I clicked on Scrivener to read over a chapter from my new novel. I was tired and had few expectations for greatness as my blurry eyes started scanning down the page. And then the strangest thing happened, words flew randomly out of my head, and they made sense. Some even bordered on profound. Others elegantly enhanced the previous draft. I felt like I was on fire. My brain could do no wrong. It was a great feeling. Unfortunately, it’s a feeling that visits me much too infrequently. Writing always comes fairly easy for me, but I must admit that it’s not always great writing. For every profound statement there are plenty of duds like “There was something non-descript and uninteresting sitting on the counter. I think.” Hopefully, I exaggerate. But the larger point is this: a draft of a novel or a story or whatever will never be written evenly. Some passages will naturally soar the first time they are written and other passages will naturally sour after they sit for a while. What’s a writer to do? The only thing that can be done. Re-read. Re-write. Re-word. Re-phrase. Re-do. Renew. The rough stretches and awkward phrasing can be eliminated, but that is where the writer earns his keep — thriving in the trenches. We can’t afford to live off the harvest of a fruitful and plentiful mind. That might only come around once in a great while. But any poor sentence can always be re-written and made better. So I write regardless of how well my brain is cooperating. Even when I don’t feel so inspired or when words get jumbled and I keep using the same phrasing over and over, I don’t stop writing. I keep pushing through for quantity, knowing that I will be back to comb through once again (or more) for quality. My draft writing is uneven. It can range from excellent to poor, but it never stays that way. Where does writing inspiration come from? I suppose every writer would answer this in different ways. I love what I call “on the spot” inspiration, when an idea suddenly strikes me out of the blue and it is seemingly unconnected with anything else I had been previously thinking. Here’s one rather recent example. For whatever reason this phrase popped into my mind: If Love is a Crime, String me up. I was struck by the beauty and bluntness of this phrase. I had never heard it before. I suppose someone else could have said it at one time or another and who knows what it would have meant to them. Once I had this phrase I had to discover what it meant for me. So I wrote it down and just started thinking. What types of settings could a phrase like this become a reality. It wasn’t long that I came into the idea that this phrase has something to do with the Underground Railroad. An escaped slave from the south. A person offering love and protection on the most vulnerable of humans. From there, I wrote a short play entitled (not surprisingly) “If Love is a Crime, String Me Up.” The setting and words flowed beautifully and I crafted what I believe is my most poignant and beautiful script I’ve ever penned. Maybe no one else will like it, but I love it. It has three wonderful characters and about a 10 minute running time, but it tells a very beautiful and poignant story about a woman who is going to chose love no matter what. I’m excited to be adding this play to the collection of plays which will be performed by my drama group The RLT Players in Penang this coming November. I love writing like this. Find a word or phrase that sticks in your mind. Then figure out what it means and write something meaningful based upon it. It’s a great exercise of discovery.